The benchmark stock market indices hit all-time highs on Tuesday led by gains in heavyweights like ICICI Bank and HDFC Bank. Supportive global markets and better monsoon forecasts by the India Meteorological Department helped with the risk-on sentiment. Gaining for a fourth straight day, the 30-share Sensex rose 370 points, or 0.95 per cent, to end at 39,276, surpassing its previous high touched earlier this month. The Nifty50 index gained 97 points, or 0.83 per cent, to end at 11,787, going past its previous high of 11,739 touched on August 28 last year. Banking stocks led the advances after Goldman Sachs said in a note that the decline in credit costs would boost growth for private sector lenders such as HDFC Bank and ICICI Bank. The shares of IndusInd Bank and ICICI Bank jumped nearly 4 per cent each, while HDFC Bank gained around 1 per cent. The three lenders made 163-point contribution to the Sensex gains. Power Grid, Infosys, and Tata Motors were the only three losing stocks on the Sensex. A surge in foreign institutional investors (FIIs) flows has lifted the benchmark indices by over 11 per cent from its 2019 lows in February. Overseas investors have pumped in nearly Rs 65,000 crore ($9.2 billion) into domestic stocks since February 20, a day after the domestic markets hit yearly low. 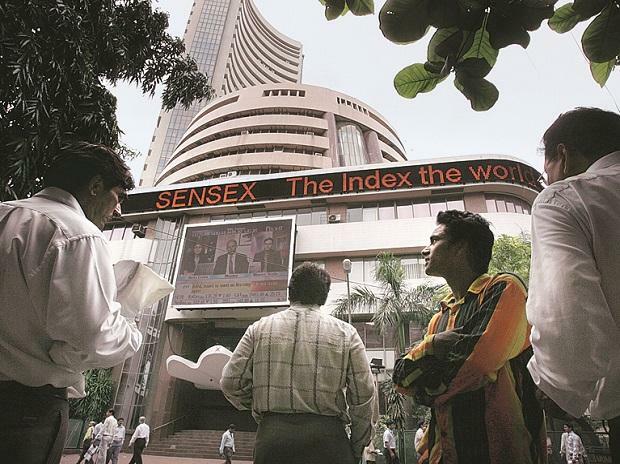 On February 19, the Sensex had ended at 35,252, while the Nifty had closed at 10,604. On Tuesday, FIIs bought shares worth Rs 1,039 crore, the provisional data provided by the stock exchanges showed. Most emerging markets have seen a gush in foreign flows amid a drop in US bond yields and the dollar. This comes after the US Federal Reserve announced a pause in interest-rate increase to counter the slowing economic growth. Besides sustained buying by FIIs, earnings growth optimism and hopes of political continuity have helped investor sentiment. “The current rally is largely due to favourable global cues, with the US Fed adopting a dovish monetary policy ruling out policy rate hikes this year and even possible rate cuts in 2020. The markets are also factoring in the re-election of Prime Minister Narendra Modi in the general election, with most opinion polls suggesting the same,” says a note by Chola Securities. Brent Crude prices have risen by more than 35 per cent to nearly $71 per barrel so far in 2019. Some analysts are forecasting Brent to go fast $80 a barrel due to geopolitical issues, supply cut, and falling inventories. Experts say while foreign flows could sustain due to benign global liquidity conditions, a spike in oil prices, earnings disappointment or election surprise could spoil the party for the Indian markets.